MAR-A-LAGO FL — President Trump said today that Alaska, still reeling from a 7.9 Richter-scale earthquake, needs to follow Finland’s example and “rake up all its extra snow” in order to avoid future disasters. Trump went on: “I was speaking to the prime minister of Finland just the other day. He calls Finland ‘definitely a snowy country,’ and said they avoid earthquakes and avalanches by constantly raking up all their extra white stuff so that it doesn’t press down so hard and squeeze the rocks until they quake. The President emphasized that unless Alaska reformed its snow-management policies, the Federal government would refuse to continue paying disaster relief. He added that unfortunately he was unable to visit the Anchorage area because the snow, “which is very wet from a water point of view,” might affect his hair and bone spurs. Besides, it was a lovely day in Miami and he had a new Number Nine iron that “urgently” needed Presidential attention. 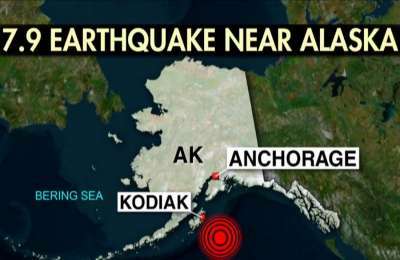 “However, ” Trump encouragingly smiled., “I urge any Alaskan rendered homeless and hungry to have fun anyway and enjoy the snow. It’s not often you get to build a 12-foot snow man endowed with 18-inch snow balls. Not that miine are any smaller.